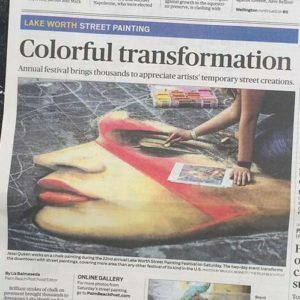 This is the story of the the Lake Worth Street Painting festival and how three Georgia artists took it by storm. 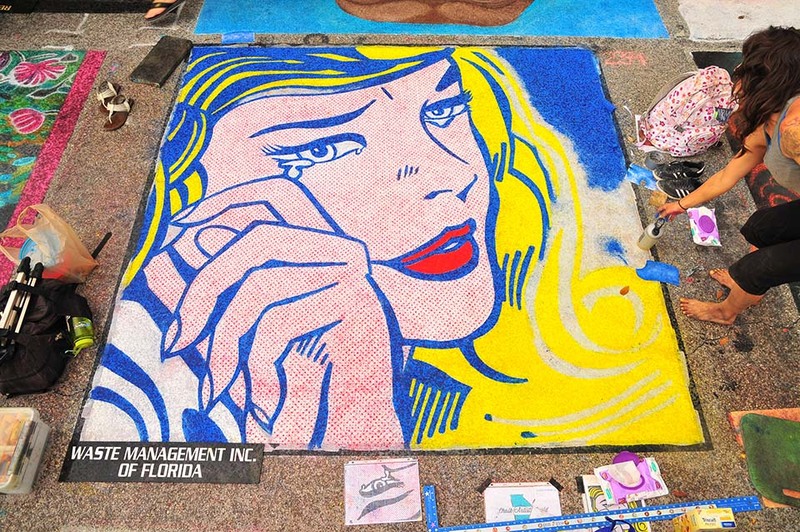 Jessi, Zach, Katie, and Albert drove down to Lake Worth, Florida to chalk the entire weekend. 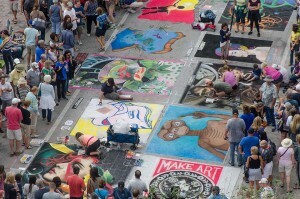 Georgia Chalk Artists Guild members Sharyn and Chad were also in attendance, which is super exciting. 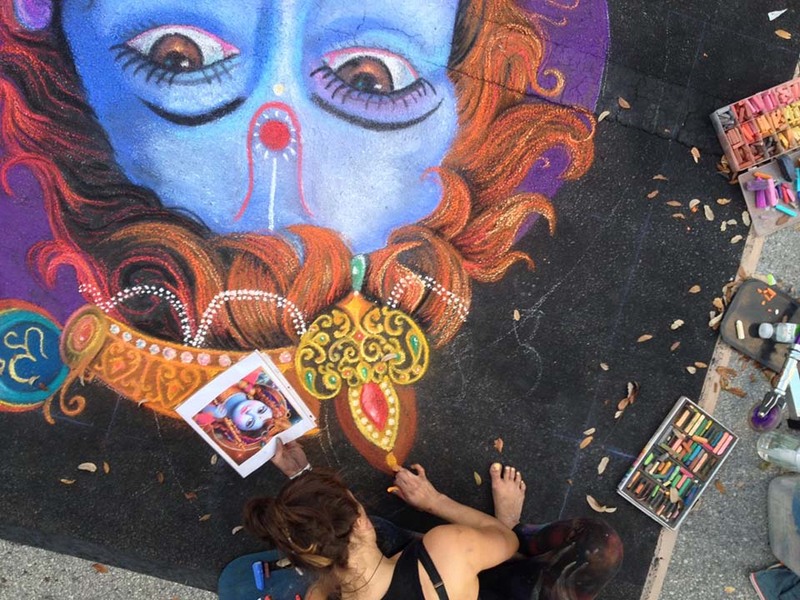 Which this weekend’s festival had five GACAG members chalking. 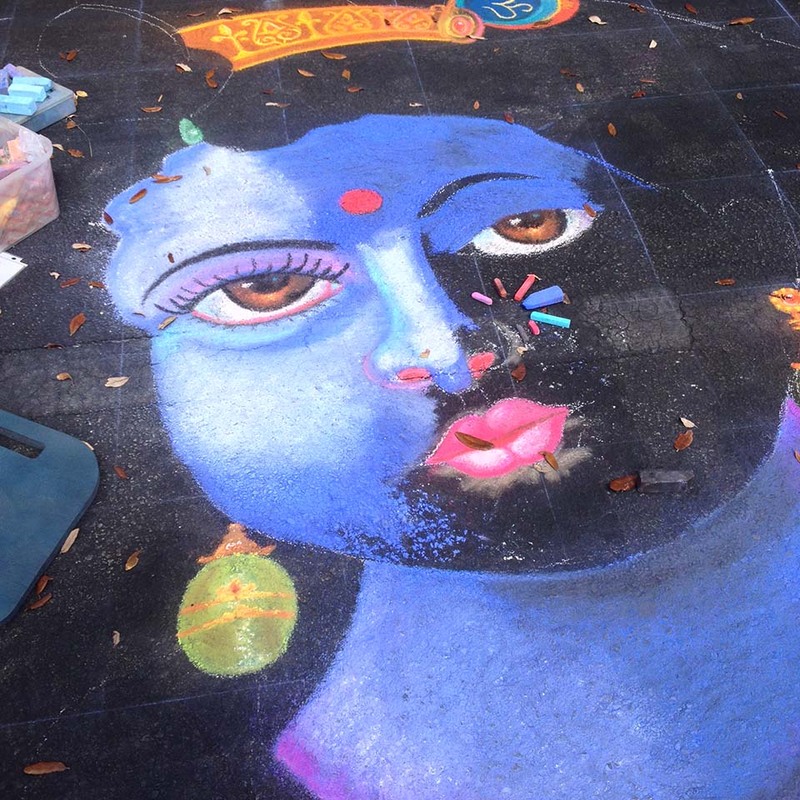 Jessi chalked a digital piece by Emilie Leger, Zach chalked ‘Crying Girl’ by Roy Lichtenstein, Katie chalked the Hindu deity Krishna, Chad chalked a two fish, and Sharyn chalked a heron. Way to go Georgia! 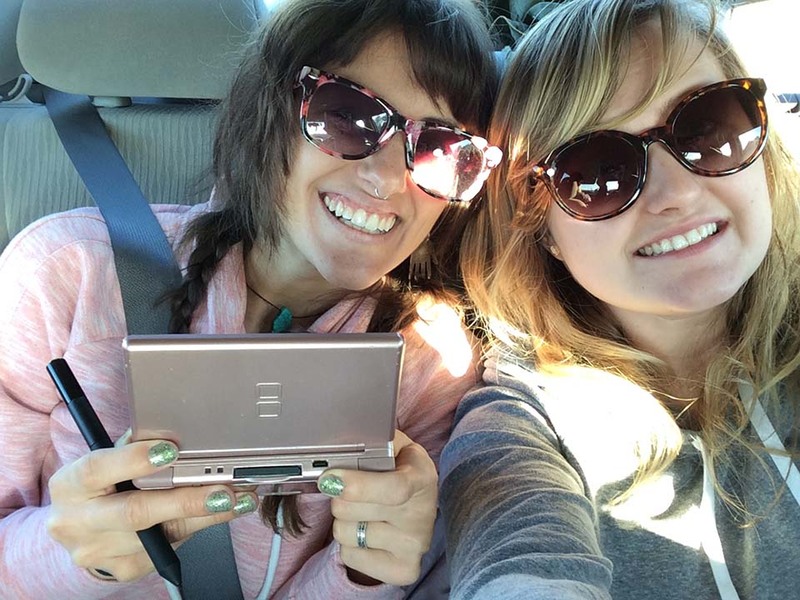 We had fun time singing along and playing games during the ten hour drive! 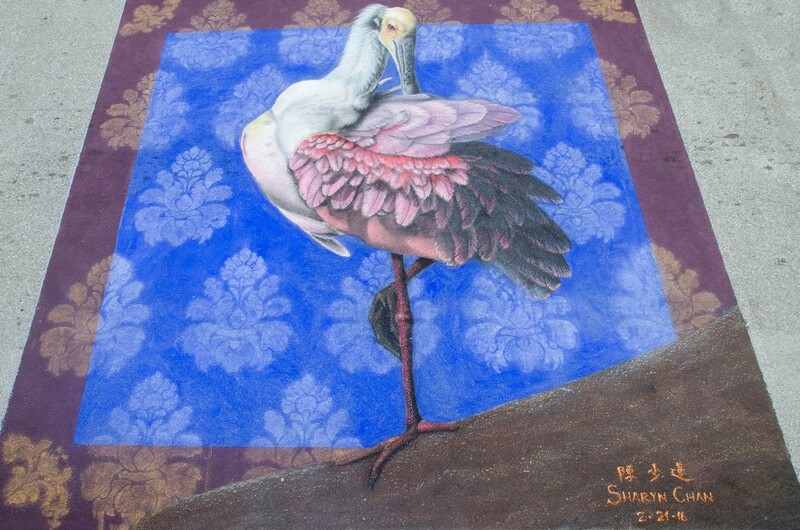 When we arrived it was nearly sundown so we checked into the hotel and quickly scouted out our chalking spots and set up shop. The first thing to do was to measure our squares for squareness and get some tempera down and hopefully grid. 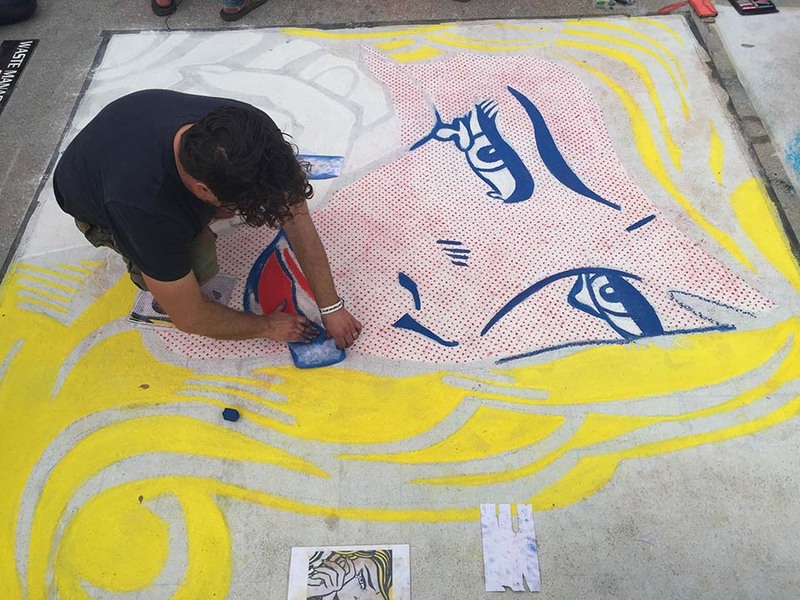 Katie was able to get a grid down Friday night and start drawing but Zach and Jessi were only able to get the paint base down, their grid would have to wait until Saturday morning. Beautiful Florida sunset awaiting our arrival. After a long day of driving and getting first steps complete, we visited with our friends from other festivals. 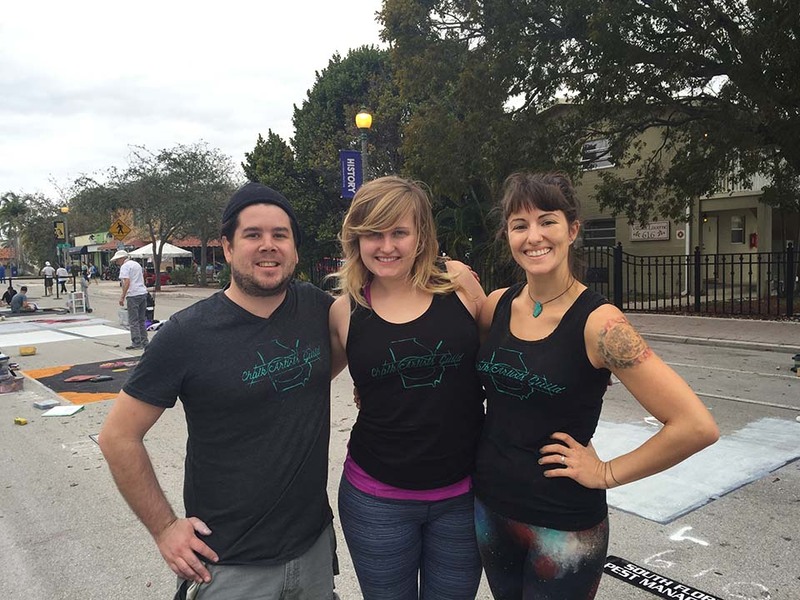 After exploring downtown Lake Worth, Katie and Albert escaped for some vegetarian cuisine and Zach and Jessi settled in and ate at a Mediterranean restaurant with their new artist friend Jessie. 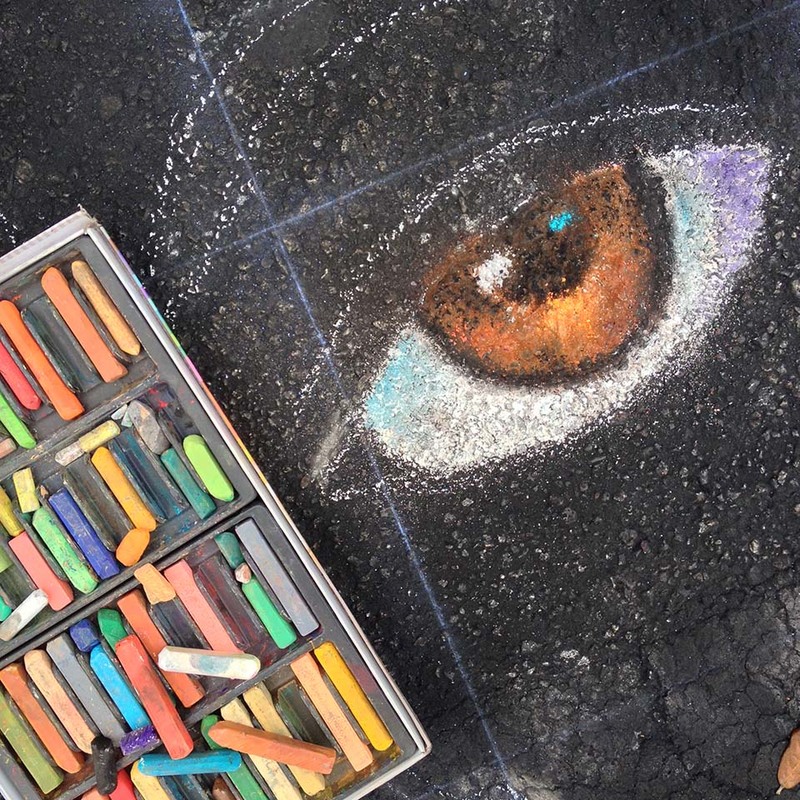 She was chalking E.T. The Extraterrestrial. Next door at one of the many pizza places downtown, the other artists gathered to celebrate the start to an awesome weekend. Day one was good. Katie, Zach, and Jessi took a quick trip to the beach to go running but found that the weather and sand were more agreeable to doing some sunrise yoga. 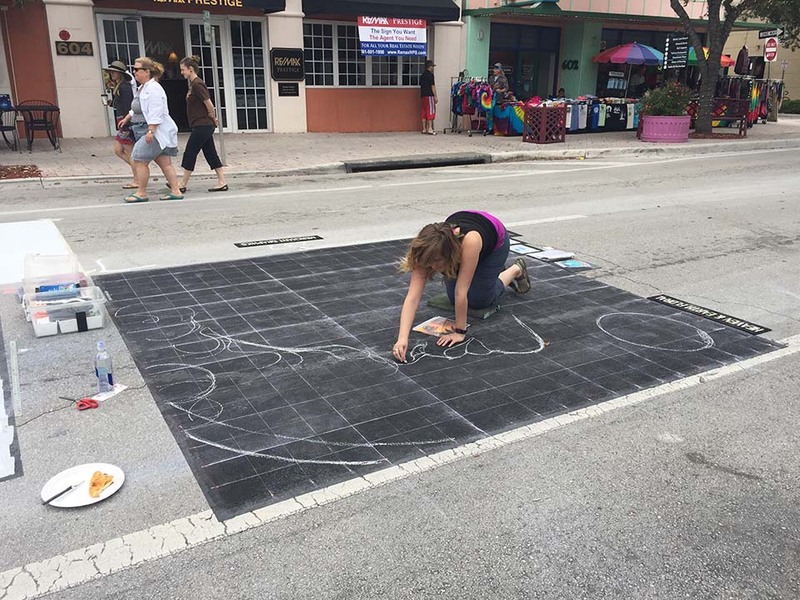 Katie led the trio in some excellent stretches that helped our artists bring their ‘A’ game to the streets. Zach and Jessi quickly gridded their squares while Katie made great progress getting her drawing blocked out. 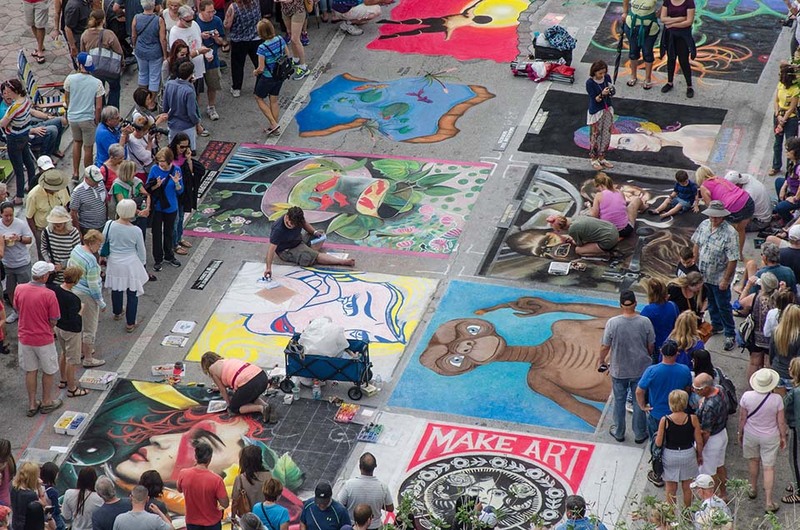 Everyone’s work took shape and after working for about 10 to 11 hours everyone’s work was drawing a crowd. 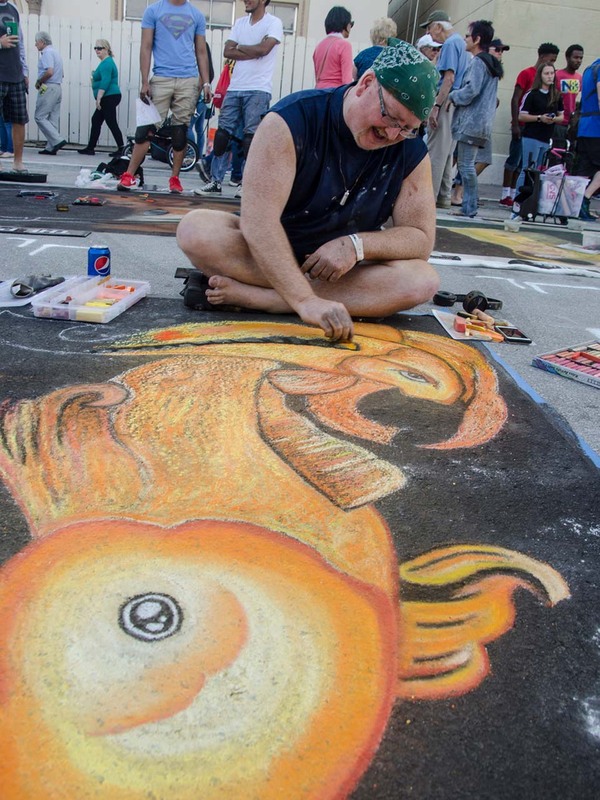 The Lake Worth festival in full swing on Sunday. 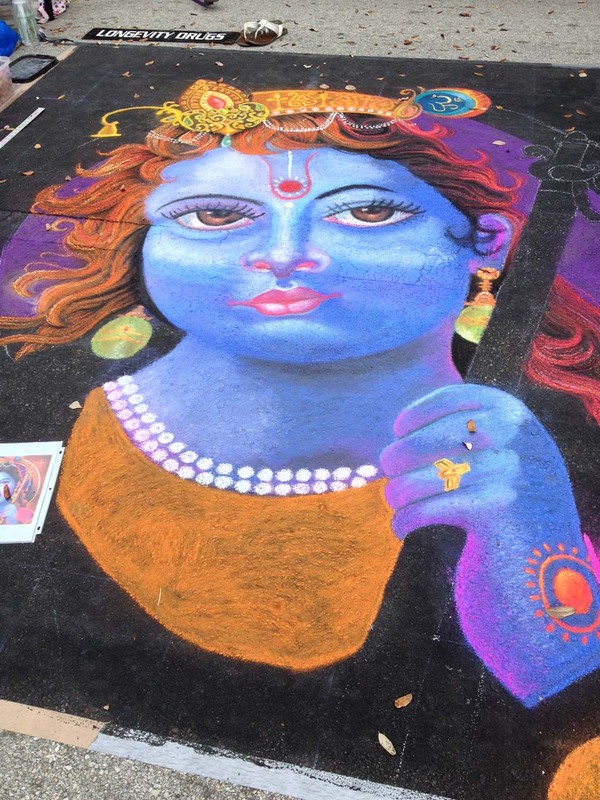 Lake worth has hundreds of artists. 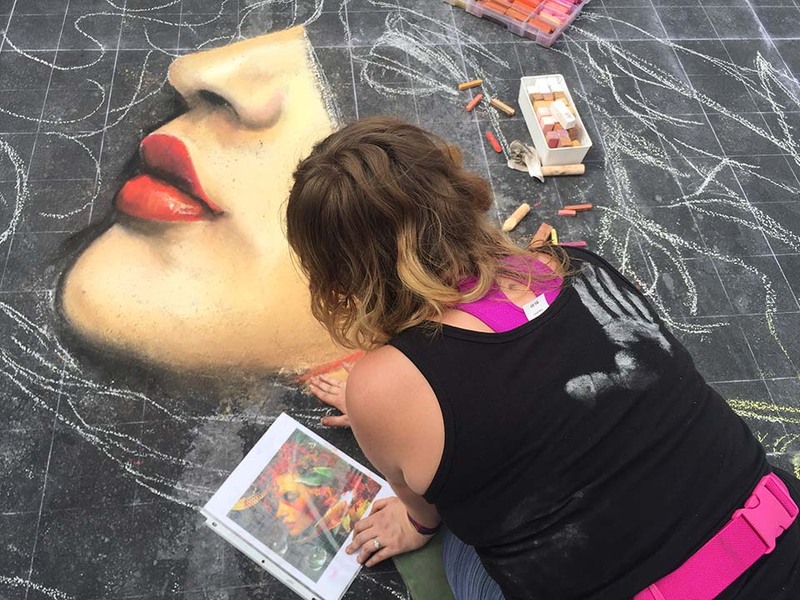 It’s the biggest chalk festival in North America. 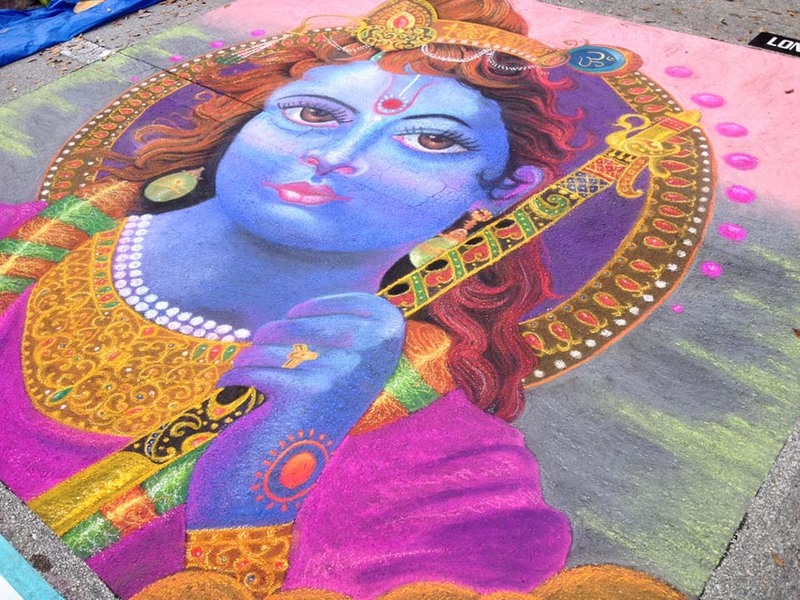 There were student artists, local artists, out-of-town artists, and featured artists comprised of both local and national artists. The featured artists were placed behind stanchions, but our Georgia artists weren’t part of the featured artists this year. 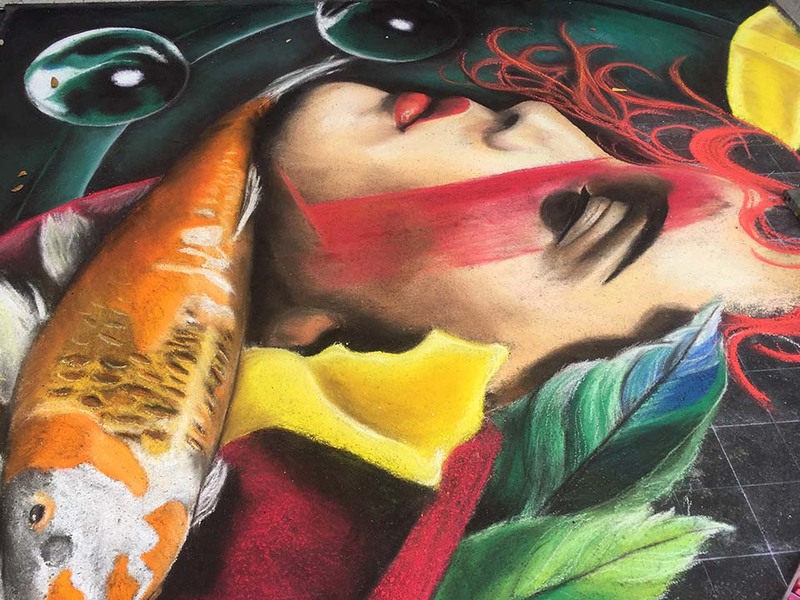 At any other festival, the lack of barricade between bystanders and artists can become frustrating, but Lake Worth has had a festival for over 30 years and most attendees understood that the performance needs room to breath. Near Zach and Jessi another performer plied his trade. 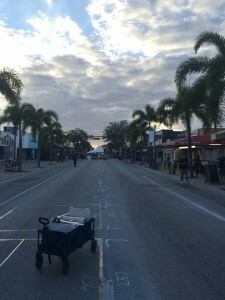 Randy Orwig was also performing this weekend and spoke with Zach about how much the festival has grown in the 15 years that he’s been coming to Lake Worth. While the crowd walked past Zach’s piece and exclaimed that there, across from his was E.T., another large crowd gathered behind him to watch a man stand still with his faithful Dog, Cat, and Mouse. As evening come on, Randy packed up stage and our artists covered their pieces. 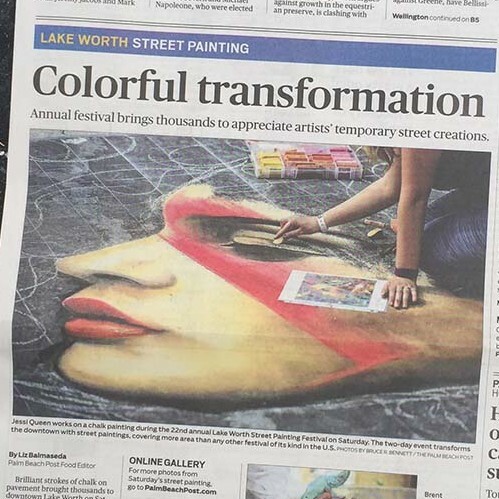 Jessi had her work featured in the local Lake Worth paper Sunday morning. Sunday morning started a little late. 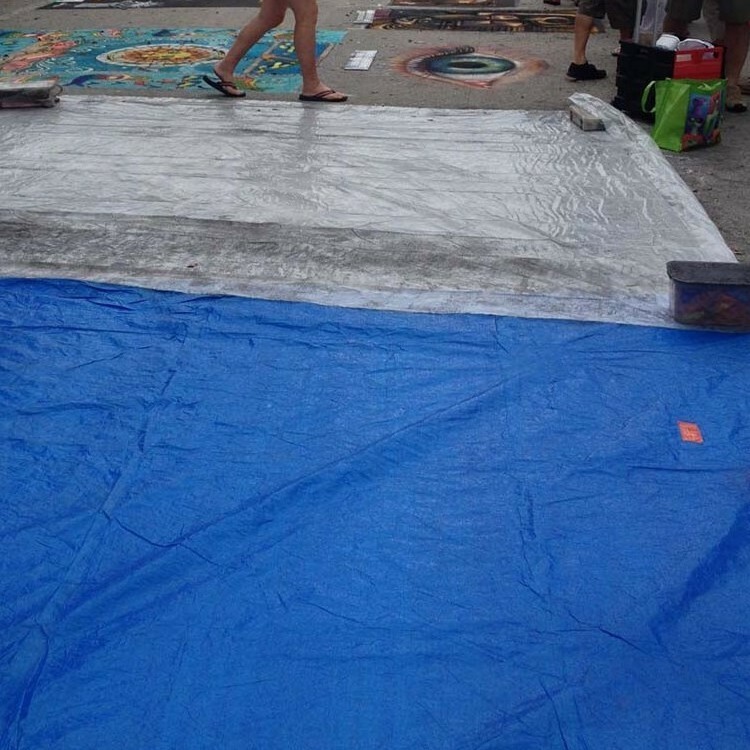 We got to our spots at around 8am amidst other artists already in progress. 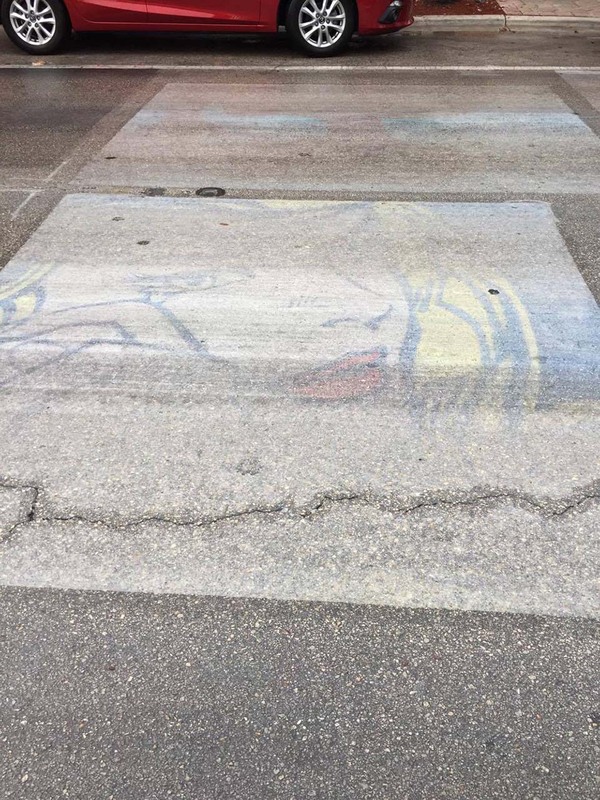 Our pieces were still covered, but the generic duct tape wasn’t nearly as effective at adhering to the pavement as gorilla tape. 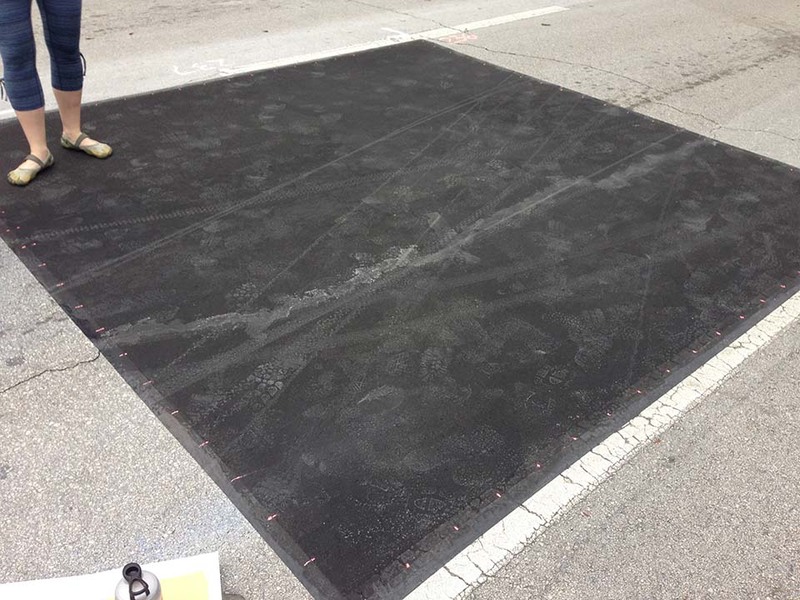 Most of the perimeter of the tarps had been pulled away such that the tarps were only resting on the ground rather than secured to it. 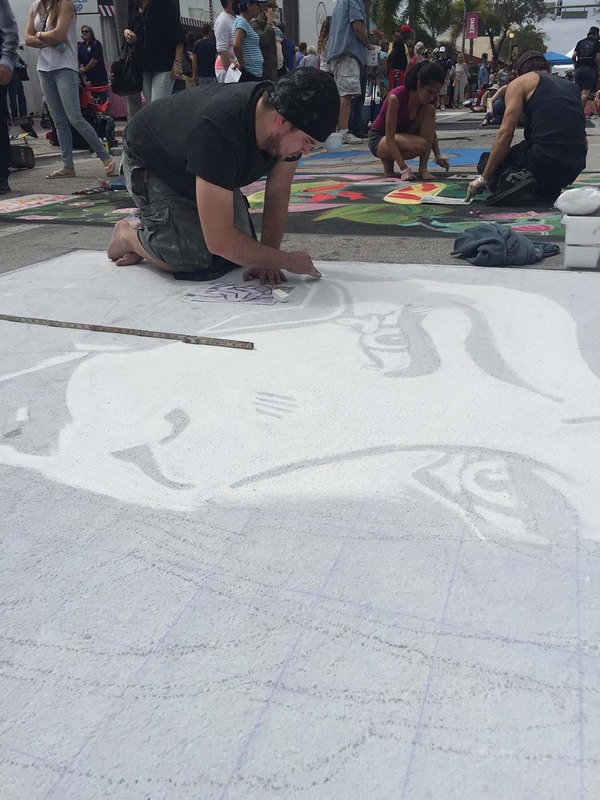 We had covered our pieces to protect it from any potential rain, the ever present wind (it strips the top layer of chalk), and people. The areas around Jessi and Zach’s work was filthy with bars and Jessi’s tarp had a hole punched in it from something but was fortunately unharmed. First thing first, Jessi went to the convenience store near her work to buy some newspapers. After picking up five and going to the register the proprietor of the shop asked “Are you in the paper or something?” She was! 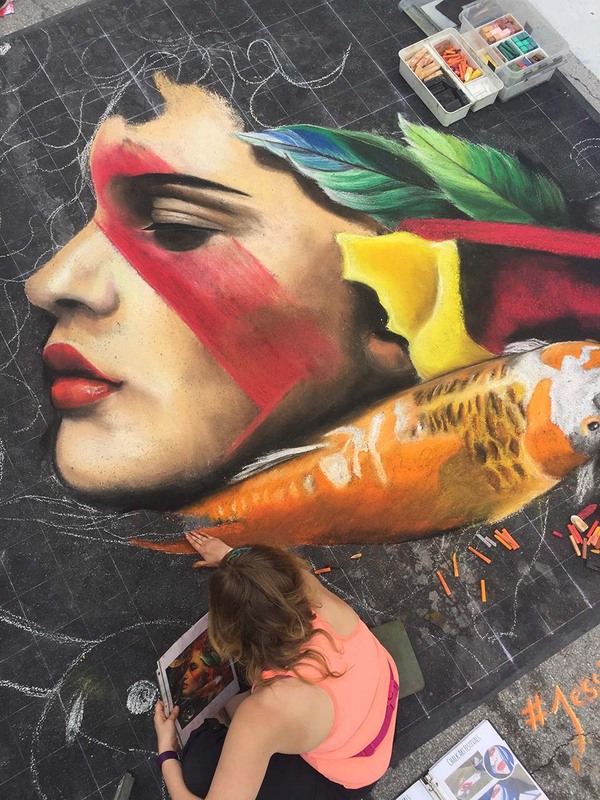 Jessi’s partially completed work was featured on the front page of the local section. Zach applying thousands of Ben-Day dots because he is crazy. 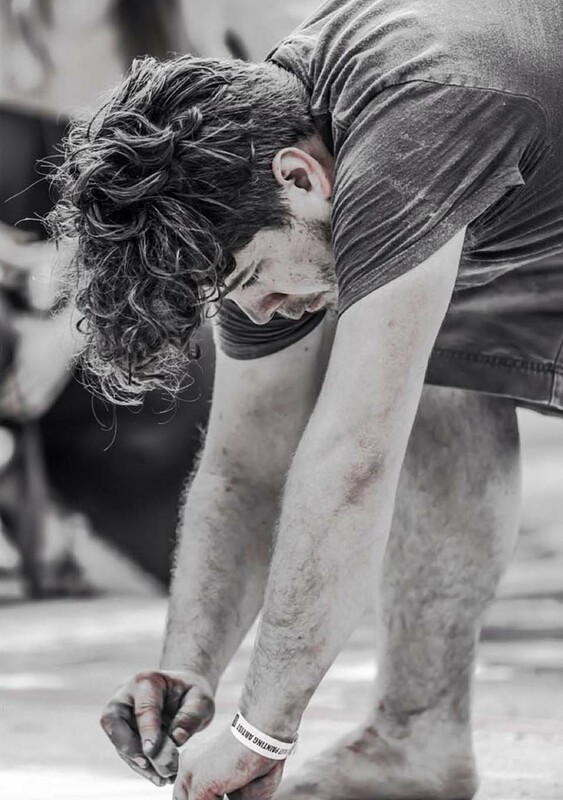 The last day of a festival is hard. 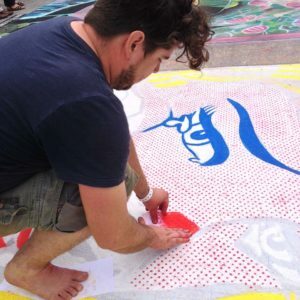 As an artist you know you only have approximately eight to ten more hours to finish your work and the crowd is denser, leading to more conversations, which distract you from your work. Zach had started to apply his Ben-Day dots the night before but began to fill in his piece which had up until then been mostly white and yellow. 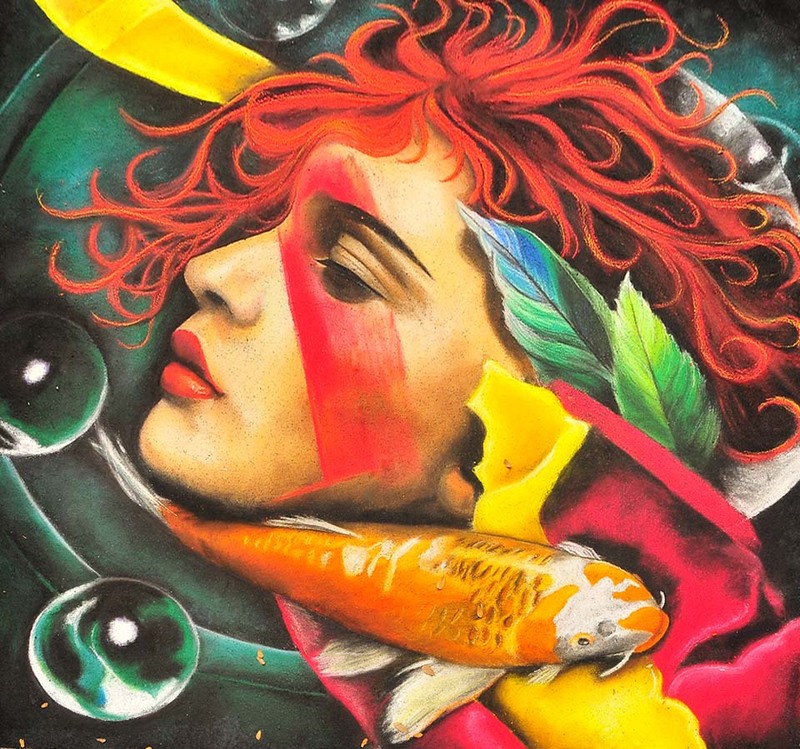 Katie made corrections to her placement of her piece’s eyes and nose and began to fill in details which really made her work stand out among the other artists around her. 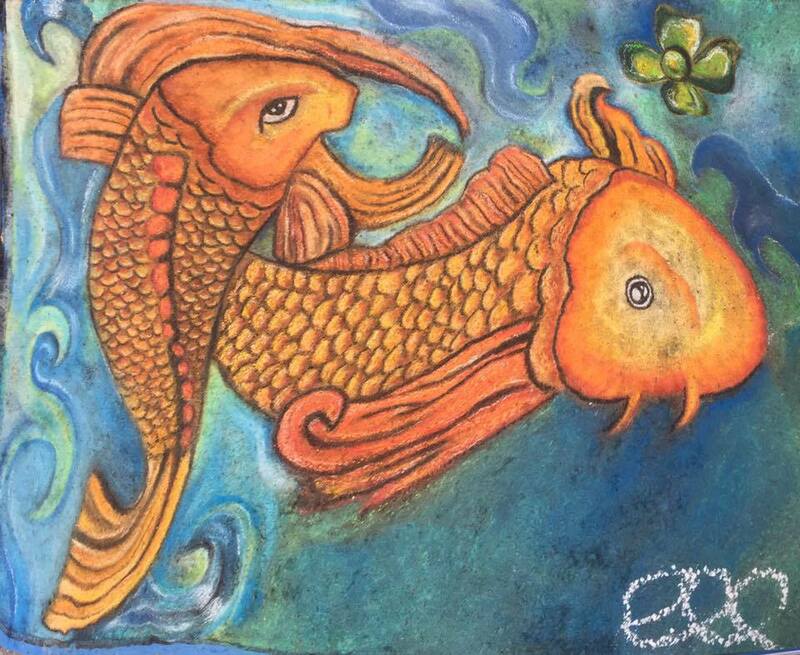 Jessi expanded her piece to include the coy fish, which was a crowd favorite (did you know everyone wants a coy fish tattoo?). During the day some rain came and went. Katie was prepared and used her blue poly tarp to easily protect her work. 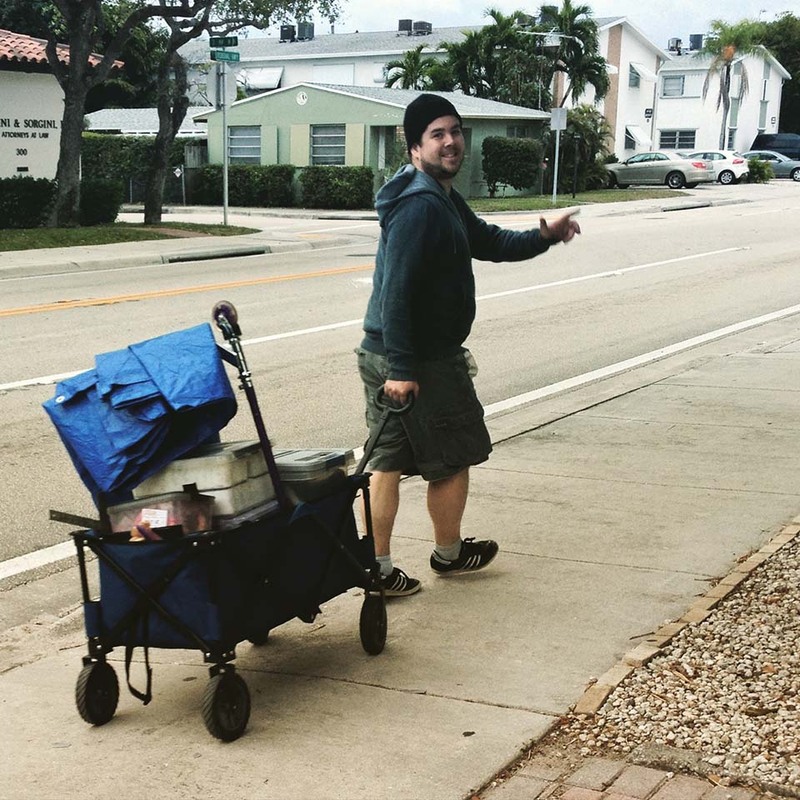 Zach was too confident in FL weather and had to run to the recycle bin and retrieve his and Jessi’s tarps. Zach was using a vinyl tarp and Jessi was using a 3 mil plastic drop cloth. 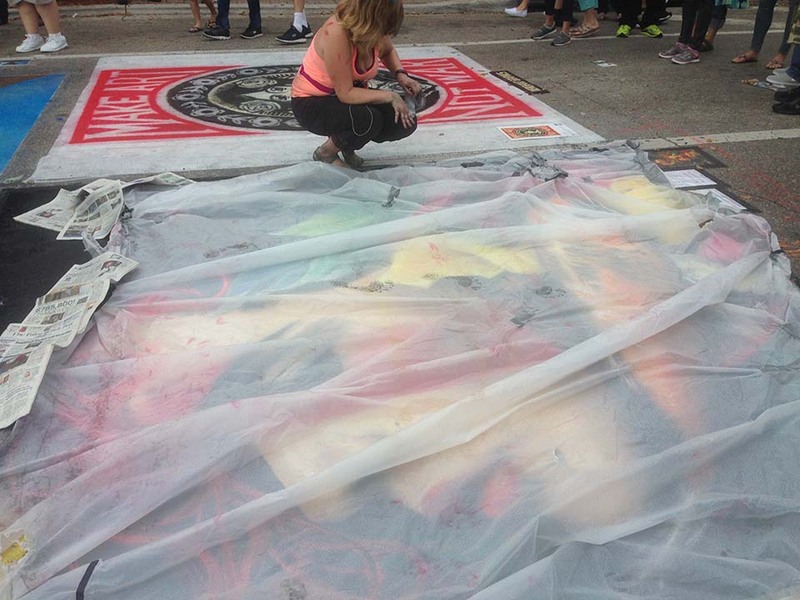 Both tarps were a little the worst for wear and were pulled apart despite the protestations of balled duct tape. While both pieces were able to be covered, the dangers wasn’t great and the sprinkles came and went. The only real damage was to time. Everyone spent at least half an hour waiting to see what would happen. After the rain passed the tarps were carefully set to the side in case of future precipitation. Katie’s blue poly tarp. Thanks dad! Rain came again later in the afternoon while everyone was scrambling to finish. Jessi sacrificed the sections of the newspaper not about her to shore up where her tarp didn’t cover which worked rather well. Pro-tip: bring some kind of coverage for your wagon too, since it’s going to be in the rain too. Fast forward to the end of the day and it’s been sprinkling and raining on and off so we cover our pieces as quickly as we can and hope that it doesn’t get worse. Some of us experienced minor damage that needed to be fix. We uncovered pieces of our work and worked in small areas to try and complete it in time. We all finished around 6pm on Sunday… just in time for rain. Zach wasn’t really finished and used the cover of rain to quickly smear in the remaining blue. The weekend was an absolute success. Our artists challenged themselves to complete stunning works and in return for their hard work they received praise throughout the exhibition. After the work was done, we packed up and drove back home. Thanks, Florida! It was great! We’ll see you soon! GACAG members standing proud in their super awesome shirts that Katie made. Zach’s completed piece. Katie! Get out of my piece! Also, its totally raining while we took this picture. You can see the rain drops in the blue. Sad face.